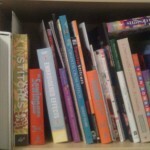 These are the books I own with cross stitch patterns and projects (exclusively). I hope they can inspire you too, there are a ton of amazing ideas in there. I hope to get to most of them eventually! These are the books I have for tatting instructions and patterns. My favorite is Learn to Tat since it is the one I refer to the most for advice, plus it has a very handy DVD I can watch to really grasp concepts. I also have a binder full of print-outs from free patterns online.